Cop-hating Johnny Strabler is recounting the fateful events that led up to the "whole mess" as he calls it, his role in the mess and whether he could have stopped it from happening. The Black Rebels, a motorcycle gang of which Johnny is the leader, cause a ruckus using intimidation wherever they go, with their actions bordering on the unlawful. 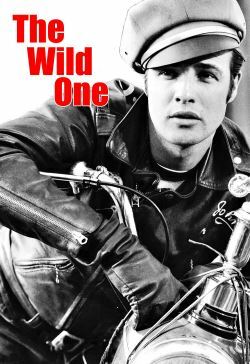 On the day of the mess, they invade a motorcycle racing event, at which they cause a general disturbance culminating with one of the gang members stealing a second place trophy to give to Johnny. Despite not being the larger winning trophy, it symbolizes to Johnny his leadership within the group. Their next stop is a small town where their disturbance and intimidation tactics continue. Some in town don't mind their arrival as long as they spend money. Harry Bleeker, the local sheriff, doesn't much like them but is so ineffective and weak that he doesn't do anything to stop them, much to the annoyance of some of the other townsfolk, who see the gang as being a criminal element not to be tolerated. Johnny is attracted to the innocent Kathie Bleeker, the waitress at the local café, who is initially intimidated by Johnny and the gang. His feelings change when he learns she is Sheriff Bleeker's daughter. The actions of the gang escalates when the Beetles, a splinter group of the Black Rebels, arrive in town. As things start to get out of hand between the gangs, some of the townsfolk, such as Charlie Thomas who is in his own right a bully albeit one of the "establishment", decide to take matters into their own hands. But Kathie may make Johnny change his beliefs, especially about what is happening this day in the town.